Along with being a great content creation tool for digital signage, PowerPoint is an excellent media player. 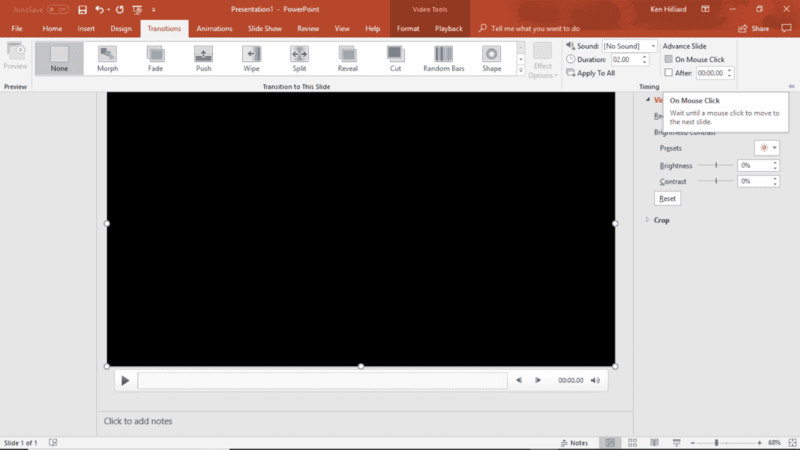 This feature makes is easy to display video in PowerPoint. You can mix in a video clip as one of the “slides” in your presentation. Or you can create a presentation consisting of a single video that plays in a continuous loop. One popular use-case for digital signage is to display a video commercial for a product or service you’re offering. Why not display your video commercial in a loop on a standard TV screen using PowerPoint? Our PowerPlayer™ product offers a simple, low-cost way to display multimedia digital signage on your TV screen using only PowerPoint. PowerPlayer allows you combine background images, fonts, text, pictures, animation and video using PowerPoint’s flexible screen layout features to produce stunning multimedia digital signage. In this article we’re going to present, step-by-step, how to display video in PowerPoint and play it full screen on your TV. In the example shown below we’re going to show you how to display video in PowerPoint in a continuous loop. 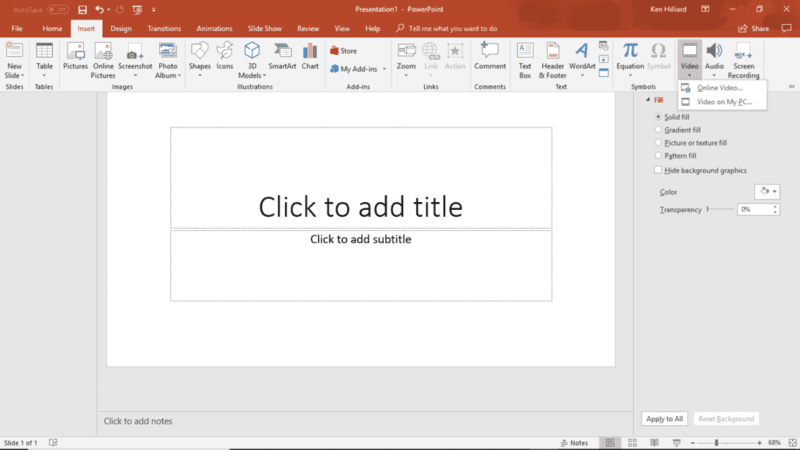 Click the Insert tab on the PowerPoint top (ribbon) menu. From the Insert sub-menu click Video (under the Media section on the far right). A drop-down will appear. Click Video on My PC. Select select the video file to be inserted in the presentation. After selecting the video file PowerPoint will display a black placeholder box for the video. By default PowerPoint displays video controls, allowing a presenter to pause/play the playback. To hide video playback controls click Slide Show tab on the top menu. From the Slide Show sub-menu uncheck Show Media Controls. Normally to advance a “slide” in PowerPoint you must make a mouse click. As the video will be displayed in a continuous loop you must disable this feature. Click the Transition tab from the PowerPoint menu. At the far right of the Transitions sub-menu (under the Advance Slide section) uncheck On Mouse Click. Follow these 5 simple steps to display video in PowerPoint. You can create a PowerPoint presentation with a single video looped continuously. Or you can create a multimedia presentation with multiple slides that includes text, images, animation as well as video. PowerPoint supports standard mp4 (h.264) and wmv video file formats. To display PowerPoint presentations on your TV take a look at our PowerPlayer™ product. PowerPlayer is a low-cost Windows 10 media player that plugs into your TV’s HDMI source input. With PowerPlayer you can create and display digital signage using PowerPoint. It includes cloud storage and a complete content management service (CMS). For more information about PowerPlayer please visit our website at www.powerdigitalsignage.com. Windows and PowerPoint are registered trademarks of Microsoft Corporation. PowerPlayer is the trademark of Power Media Design.